Admittedly, I remember very little from the 1970s beyond having panel walls in our kitchen, and matted mustard carpeting in the living room. 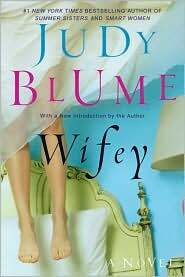 So, luckily, I am able to see beyond the frustrations of sexually stifled housewife Sandy Pressman, and instead take Judy Blume’s hidden-in-the-hamper novel from the era for something better: Wifey is Pure. Comic. Gold. The book opens with Sandy Pressman looking out her window upon waking, and finding a man wearing just a bed sheet — which he quickly sheds — and a stars and stripes helmet, standing on the edge of her yard. He precedes to coax himself toward the proverbial second base, then zip away naked on his motorcycle. She calls her husband, who then calls the police. When a cop stops by to get her statement, Sandy recounts the “crime scene” and adds the final detail that defines the tone of the rest of the book. “I just remembered … he was left handed,” she tells the sergeant. Well, well, wellsy, Lady Hot Pants Pressman. You noticed. Rawr. This experience kicks off a sexual something. Not an awakening, per se. Sandy took some pretty experimental tours around the old block back in the day with a super-creative lad named Shep. But she has gained a sort of sexual acceptance: that her three minutes of Saturday night special — which her blase husband Norman tops off with gargling, scrubbing, and air freshener — is no match for the memories of her time with no-holds barred Shep. Meanwhile, all around her, the mens are sitting up and taking notice of the Jackie O. lookalike. Her body becomes a sort of scratching post for those who inhale her pheromones. And a good time is had by all. This causes an understandable amount of disdain for her mousy master of a husband, who does things like cut out photographs of hairstyles from magazines for her to consider, and push her toward more time at the Country Club, where she should be learning to play golf and tennis and socializing with the sophisticates. What a delicious, hokey, and charming read from the woman who taught us all how they strapped on maxi pads in the old-fashioned days. Thankfully we don’t have to hide it on a high shelf anymore. It’s so hard to imagine a time when this novel wasn’t the height of hilarity.